Engine: 6.3-liter DOHC 32-valve V8 510 hp (375 kW) at 6700 rpm, and torque of 457 lbs-ft (620 Nm). The car can accelerate from 0 to 100 km/h or ~0-60 mph speed in just 4.2 seconds time range. Top speed is 250 km/h or 155 mph. This car can do a quarter mile in low 12 seconds time range. The Mercedes Benz Coupe model comes with an AMG SPEEDSHIFT MCT 7-speed sports gearbox with four transmission modes. It features a front engine and rear-wheel drive system. Curb weight is 3700 lbs (1678 kg). Wheelbase is 2766 mm (108.9 inches) long. Car length is 4732 mm (186.3 inches). Width is 1770 mm (69.7 inches). Height is 1387 mm (54.6 inches). Fuel economy is 10 mpg in city and 16 mpg in highway. The new model features the highest level of driving dynamics, a spectacular design, and technology transfer from the world of motorsport. This model originally made its world debut at the Formula 1 German Grand Prix on the Nürburgring. It is equipped with adjustable AMG coil-over sports suspension. Also, features an AMG high-performance compound braking system, an adjustable carbon-fiber rear aerofoil, a functionally tuned front splitter and sports tires, and active rear-axle transmission cooling. These features comes with a special AMG Track Package. 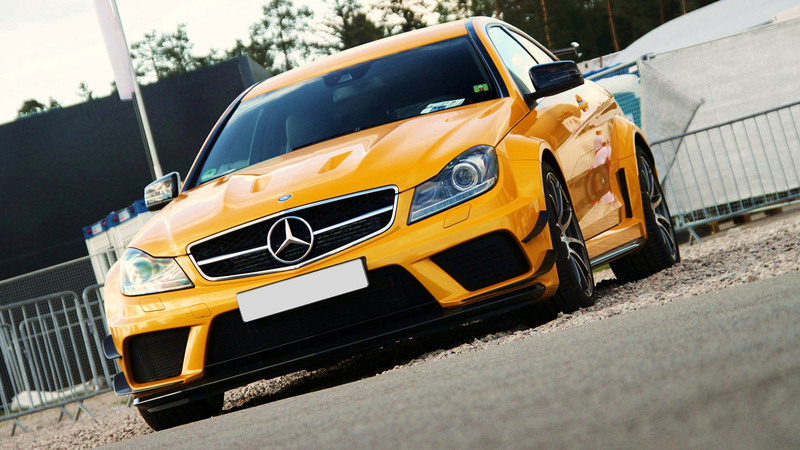 The price for this 2013 Mercedes Benz C63 AMG starts from around 115,400 Euro which is equal to about 148,240 USD ($). It is for sale since July 2012. There are only 800 units released of this model, and all 800 already are sold out. No more units will be released. At least no plans for that, but who knows what the future brings.